Sakura Review: Simple and Gorgeous | Nerd Much? Sakura is the newest game from legendary designer Reiner Knizia. He has designed over 600 games, ranging from strategic historical games to light card games. Sakura falls into the lighter category — it’s chaotic, silly, and great with a rowdy crowd. This one had been on my radar for a while, and I was excited when Osprey Games sent me a copy. After playing it with my game group, I can say that it’s almost everything I’d hoped for. In Sakura, each player is an ambitious artist in the Imperial Garden trying to paint the Emperor as he observes the cherry blossoms. This opportunity only comes once a year, so the artists will do whatever it takes to get close to the Emperor to create the best painting. If you get too close, however, you risk bumping into the Emperor and damaging your reputation! The game board represents the Imperial Garden. It’s a linear path with three cherry blossom spaces that the emperor will pause at. Players walk behind the emperor and vie to be the closest when he reaches one of the three cherry blossoms (or sakura spaces). Turns are simultaneous, with each player choosing a card from their hand. Everyone reveals their cards, and the card with the lowest number goes first. Each card has two effects: a garden action, which moves either the Emperor or another player (or yourself, if you’re clever); and a player action, which moves the player who played the card. There are really two decisions you make each round: which card will you play, and how will you resolve its actions? Playing a low-numbered card to go early isn’t always best, given your position on the board. You’ll want to carefully consider the possible moves opponents will make before playing a card that moves you forward three spaces, for example. Cards are resolved from lowest number to highest, and even when you play a low number like 12, you can find yourself going third and having your plans wrecked. Fortunately, you will usually have choices to make when you resolve your card. Some cards allow you to choose to move forward or backward (and you might get to choose whether the Emperor moves forward or backward as well). A major factor to consider is that only empty spaces are counted when moving. So if there are four people ahead of you but only two empty spaces between you and the Emperor and you move your character ahead three spaces, you just disgraced yourself. When you are disgraced, you immediately move backward three empty spaces and lose one point. Everyone starts with five points, and in my experience, it is very possible to lose all of your points. If your pawn is directly behind the Emperor, you’re in a good spot to earn points when he reaches a cherry blossom. You’re also in a good spot to be messed with by other players. And in Sakura, you’re going to be messed with a lot. The result of these simple mechanics is a stressful sort of “race” — you want to be first (or close to it) when the Emperor reaches the cherry blossoms and points are awarded, but after that, you’ll be treading carefully, keeping yourself in a good position but avoiding getting too close to the Emperor. It’s too silly to be spiteful or mean, but there is room for strategizing. The board, compact box, and components are excellent quality, and Kevin Hong’s artwork is spectacular. I’d expect nothing different from a game about paintings, but the cards feature some of the best artwork I’ve seen in a board game. 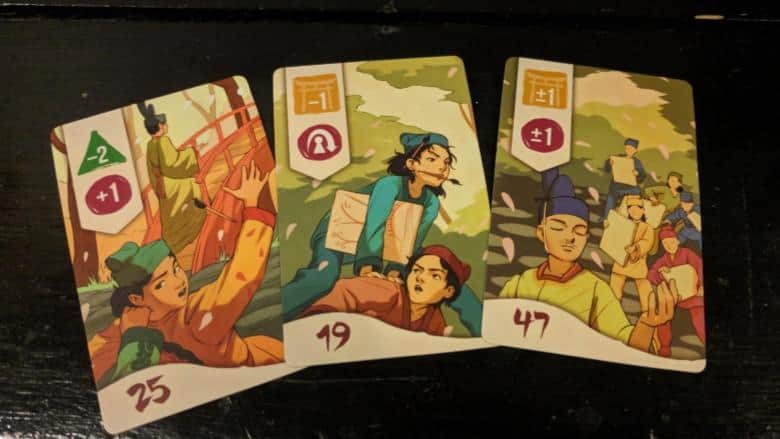 In addition, the illustrations are thematically fitting — a card that sends your pawn hopping over other pawns shows a painter, brush in her teeth, leapfrogging over another. It’s funny, gorgeous, and perfect for the game’s mechanics. The only shortcoming of the components is the cards’ finish, which led them to stick to one another. This may change as they get broken in, and it’s a minor gripe. Tension builds naturally as players approach the scoring areas, and the cherry blossoms divide the game nicely into three distinct phases. When players can’t score points because they’re far from a cherry blossom space, they can instead make others lose points by forcing them to bump into the Emperor. Losing just as fun as winning since it’s easy to focus your energy on disgracing other players rather than getting close enough to the Emperor to score. And when someone sends you into the Emperor, it’s never personal. Anyone who has a chance to disgrace another player almost always will, because it’s funny. Though there are no “bad” cards, you sometimes find yourself holding a hand of cards that will cost you a point no matter what you play. This is never bad luck, though, as it’s up to you to manage your hand so that you have a variety of options and a range of numbers. It’s particularly crucial to keep an eye on the numbers you hold — a hand of all low or all high numbers can be disastrous. Sakura is consistently hilarious. It’s funny when you send the player farthest from the Emperor way ahead so that they bump into him. It’s also funny when the Emperor charges forward and triggers a scoring round when no one expected it. It’s funny when the Emperor starts moving backward and causes a panic of painters scrambling away. Will some players find Sakura’s offerings shallow? Absolutely. It isn’t a game for everyone, and there’s no randomized setup. But players who can appreciate the game’s clever theme and volatile mechanics will have a blast. This is a “take-that” game done right. Being disgraced is just a minor sting, but it happens often enough that you’ll have a chance to make everyone lose a point. The game is too short and simple for any vendettas. When it’s over, everyone laughs, and no one cares too much about their score. The highlight of the game for me was when I was in the hot spot, directly behind the Emperor. If you don’t have a low card to play, you find yourself at the mercy of your opponents — and they rarely have mercy in this game. Sakura’s wide range of two to six players offers different experiences. At six players, every round is exciting and can go a number of different ways. The crowded path makes it easy to jump far ahead in a single turn, and when the Emperor changes directions, things get messy. The six player experience is a bit on the long side for the game’s simplicity, but it doesn’t leave you burned out. At two players, it becomes a strategic zero-sum game, and the dummy player is unsatisfying — but when is that ever a brilliant two-player variant? Yes, in this case I would consider it a variant. 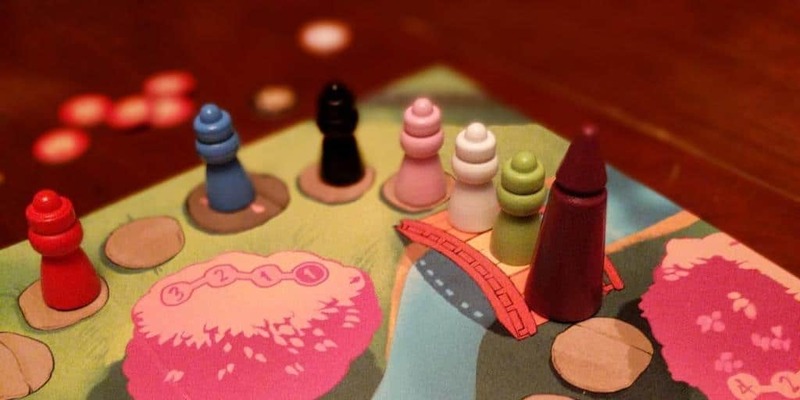 With more than two players, you have yourself a rollicking old-fashioned paint-off. At four and five players, the game is at a sweet spot. Sakura may grow old after twenty or so plays, but you’ll have gotten your money’s worth by then anyway. I’ll be playing this one for a while. 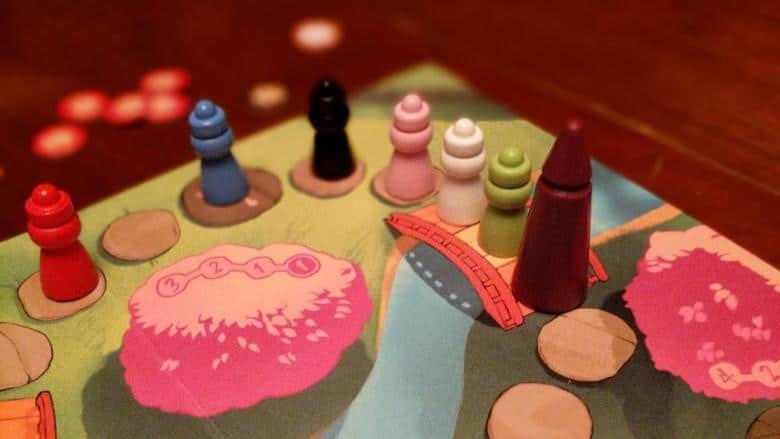 It belongs alongside Steffen Bogen’s Camel Up — both are rowdy games for a big group, and they’re different enough to have both in your collection. 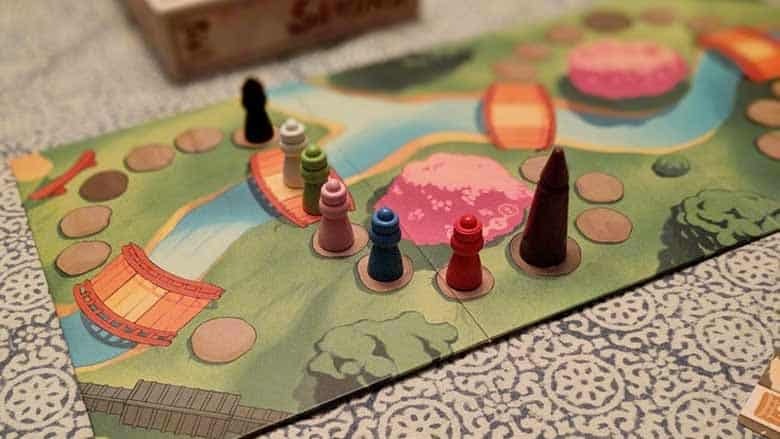 Sakura is simple and silly — it might not be a deep game, but it’s still a wonderful design from Reiner Knizia worth picking up.